ANDREW CRESSWELL DAVIS formed STACKRIDGE when he was only 18 recording 5 albums over 6 years with the fifth album “The Man In The Bowler Hat” being produced by Sir George Martin. When he first set foot in London in the early 70’s he found himself playing acoustic guitar on JOHN LENNON’s “Imagine” album. In 1978 he formed pop duo THE KORGIS with James Warren and achieved two notable hit singles “If I Had You” and “Everybody’s Got to Learn Sometime”. Since then Andrew joined TEARS FOR FEARS playing keyboards live, touring with JULIAN COPE on the “World Shut Your Mouth Tour” as well as playing live with BILL NELSON and more recently GOLDFRAPP. Having released in 1990 his first critically acclaimed solo album “Clevedon Pier” he has now recorded an absolutely stunning album with a mixture of pop, rock, roots and some classical influences. 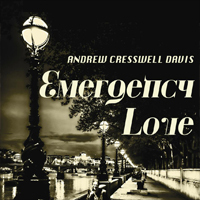 The album “Emergency Love” is based around great songwriting and strong vocals. The title track itself is an excellent example of how to take a tender theme, present it in a reasonably traditional singer songwriter setting and simply allow the music to speak for itself. Whether the gentle stroll of "Downtown Lights", the understated yet insistent "Magdelene", which I could easily imagine Mark Knopfler singing, or "Charlie's Dead" which contains an authentic country rock vibe, it's hard not to get caught up in the believable manner with which Davis delivers the vocals. Add in some quite wonderful arrangements, where a deceptively simple sheen allows some seriously intricate work to feel smooth and unforced and it's no surprise everything here works so well. As the leader of such sturdy English bands as Stackridge and the Korgis, Andy Davis built a career that will see him through old age with substantial songwriting royalties. Both gigs were known for their idiosyncratic approach to pop, and his new solo album strives for eclecticism within a narrower tonal range. With his hoarse voice and mid-tempos, Davis seems to be cruising, and if the tongue-in-cheek ambitions that made the Korgis such a vital addition to the new wave canon are missed, there's no shortage of great tunes and clever lines. Blues and trad are the preferred modes of presentation, but Davis's pop instincts make sure the songs are concise and the arrangements serviceable. It's what used to be referred to as a "journeyman's record," one whose merits are difficult to repeat, except that Davis has been repeating them his entire professional life.